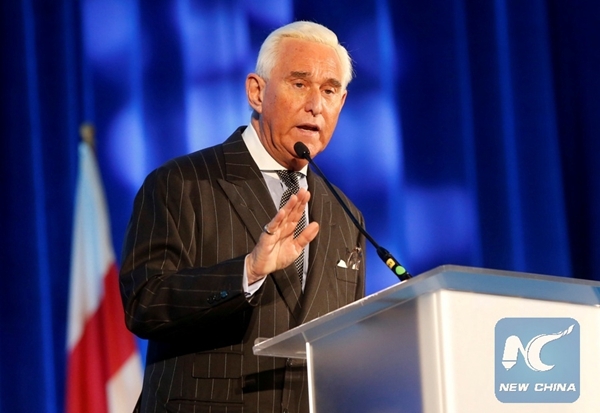 Roger Stone, former campaign adviser to U.S. President Donald Trump, pleaded not guilty on Tuesday to charges stemming from the ongoing Russia investigation led by special counsel Robert Mueller. Stone, charged in a seven-count indictment with obstruction, lying to Congress and witness tampering, appeared Tuesday for his arraignment at the federal courthouse in Washington D.C. and entered a not guilty plea. He did not speak to reporters following the arraignment and is to appear in court again on Friday. According to court papers unsealed last week, Stone has been indicted on seven counts in connection with the Mueller probe, including one count of obstruction of an official proceeding, five counts of false statements, and one count of witness tampering. The indictment relates to Stone's communications with Julian Assange, founder of WikiLeaks, a group that leaked information in the weeks ahead of the 2016 presidential election, which damaged the campaign of Hillary Clinton, then Democratic candidate for presidency. The charge sheet alleges that Stone, when appearing before investigators, lied about his knowledge of the incident and that he attempted to get others to change their testimony. The indictment also states that a senior Trump campaign official was "directed to contact Stone about any additional releases and what other damaging information (WikiLeaks) had regarding the Clinton Campaign." Stone has claimed that he's being "persecuted" because of his ties with Trump but providing no details to support his claim. He has also said he's innocent, vowing to plead not guilty and fight to clear his name "against these politically motivated charges." A 66-year-old veteran political operative, Stone left Trump's campaign in 2015, but continued to back Trump for the presidency. He was arrested by the FBI in a predawn raid at his Florida home. He's free on a 250,000-U.S.-dollar bond. Mueller, who was appointed in May 2017, is looking into the alleged Russian interference in the 2016 U.S. presidential election and any potential collusion between the Trump campaign and Moscow, among other matters that may arise from the investigation. His team has indicted or gotten guilty pleas from 34 people and three companies. Trump has repeatedly dismissed any collusion between his campaign and Moscow, while slamming the Russia probe as a "hoax" or "witch hunt." Acting Attorney General Matthew Whitaker said Monday that the investigation is "close to being completed," although there has been no confirmation of this from Mueller's office. ​Roger Stone, former campaign adviser to U.S. President Donald Trump, pleaded not guilty on Tuesday to charges stemming from the ongoing Russia investigation led by special counsel Robert Mueller.